Our client just bought a brand new home and came to us to help furnish and decorate the master bedroom, dining, and living room. Years ago, she was all about dark, heavy furniture. 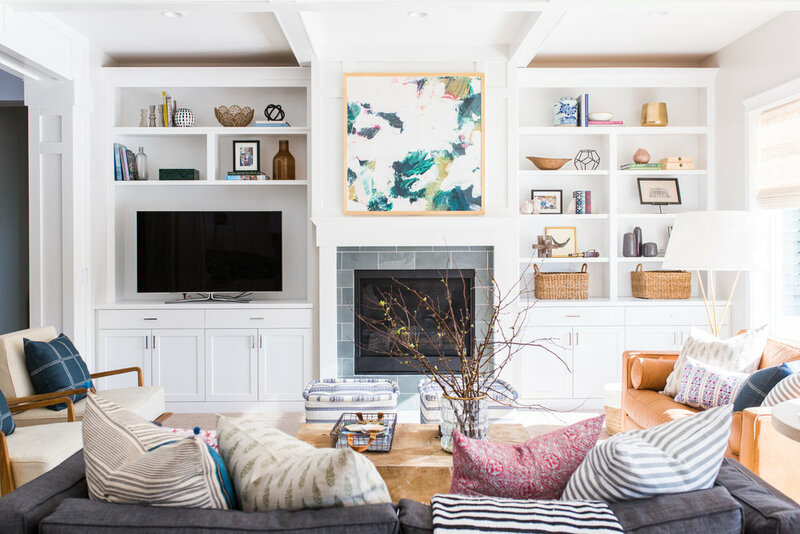 With a new home, she and her husband wanted a fresh space. They ended up moving their old furniture to the basement, which gave us a clean slate to work with! She requested the design to be "bright and airy" and we love how it turned out. You can even see the space in action on our webisode! The bones of the home were already gorgeous. Our job was to map out a floor plan and add furniture, accessories, and window treatments. The living room is where all the fun happens, so we wanted to make the space feel comfortable, relaxing, and fun. It's also the first space you see when you walk in the door, so we also needed it to be beautiful (obviously)! We love the challenge of styling built-in bookshelves. The key is balancing them just right so they don't look too cluttered or too sparse. The white walls provided a great canvas that allowed us to have fun with color and pattern. We decided on a big piece of artwork on the fireplace and added pattern and color in the pillows. We added levels of texture with a cozy, thick-pile rug from McGee & Co. The raw texture and warmth from the coffee table breaks up the rug and anchors the room. As you can see, the great room opens to the dining room - we wanted it to flow, without feeling matchy. We kept things simple and carried the pattern in the custom curtains made with our own fabric! We layered artwork from McGee & Co. and a Schoolhouse Electric clock for a collected look. With it's all white features and dark kitchen island, we added accessories that would warm this kitchen up! We filled it with rich colors, like that burgundy bowl, and wooden accessories. More on warming up your kitchen here! We ended up designing a custom headboard to get the perfect height for the trim and to create a really great focal point. We used the Valencia rug as a jumping off point for the room's color palette. We love the muted tones, metallic feel, and the blend of feminine and masculine style. We tied in the trim on the headboard with lacquered grasscloth night stands from McGee & Co. The large statement lamps add a beautiful warmth to the space. We wanted a big statement piece to balance out the room and tie it together. We used our Spring Fog 2 artwork.